Pectin gelation characteristics can be divided into two main types: high methoxy gelation and low methoxy gelation. The traditional, commercial sources of pectin have been citrus peel and apple pomace. Often this is a waste material from another industry such as apple pomace from a cider producer. Pectin is a complex polysaccharide consisting mainly of esterified D-galacturonic acid resides in an alpha-(1-4) chain. The acid groups along the chain are largely esterifed with methoxy groups in the natural product. There can also be acetyl groups present on the free hydroxy groups. Pectins also carry nonsugar subsituents, essentially methanol, acetic acid, phenolic acids and occasionally amide groups. The esterification of galacturonic acid residues with methanol or acetic acid is a very important structural characteristic of pectic substances. The degree of methylation (DM) is defined as the percentage of carbonyl groups esterified with methanol. LM pectins can gel in the presence of divalent cations, usually calcium. In these systems gelation is due to the formation of intermolecular junction zones between homogalacturonic smooth regions of different chains. The structure of such a junction zone is generally ascribed to the so called 'egg box' binding process. Calcium induced gelation is predominant in low methoxy pectin gels. Gelation is due to the formation of intermolecular junction zones between the 'smooth' HG regions of separate polymers. The nature of the interaction, although known to be electrostatic to some extent, is still debated. Pectin is sourced from plant cell walls and is analysed as a soluble and insoluble fraction as galacturonic acid after hydrolysis. The fruits and vegetables which are especially rich in pectins have dietary fibre contents in the range of 1-2%. In order to increase societal intake in fibre it is therefore preferable to add products concentrated in fibres. Mixtures of pectins with other polysaccharides such as alginate has found that good gels are formed from high methoxy pectin and guluronic rich alginates. A pH above 4 also hinders the gel formation. Voragen, A., et al., In Food Polysaccharides and their applications, 1995, Marcel Dekker Inc., pg 287-340. Thibault, J.-F., Ralet, M.-C., In Advanced Dietary Fibre Technology, 2001, Blackwell Science, pg 369-378. Ridley, B., O'Neill, M.A., Mohnen, D., 'Pectins: structure, biosynthesis and oligogalacturonide-related signalling', Phytochemistry, 2001, 57, 929-967. 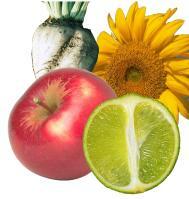 Pectin is found in most plants, but is most concentrated in citrus fruits (oranges, lemons, grapefruits) and apples. Pectin obtained from citrus peels is referred to as citrus pectin. Increasing knowledge of the interaction of pectins with other hydrocolloids is opening opportunity for its use as a more tailored polymer than previous uses. Pectins are a family of complex polysaccharides that contain 1,4-linked α-D-galactosyluronic residues. Three pectic polysaccharides, homogalacturonan, rhamnogalacturonan-I and substituted galacturonans, have been isolated from primary plant cell walls.